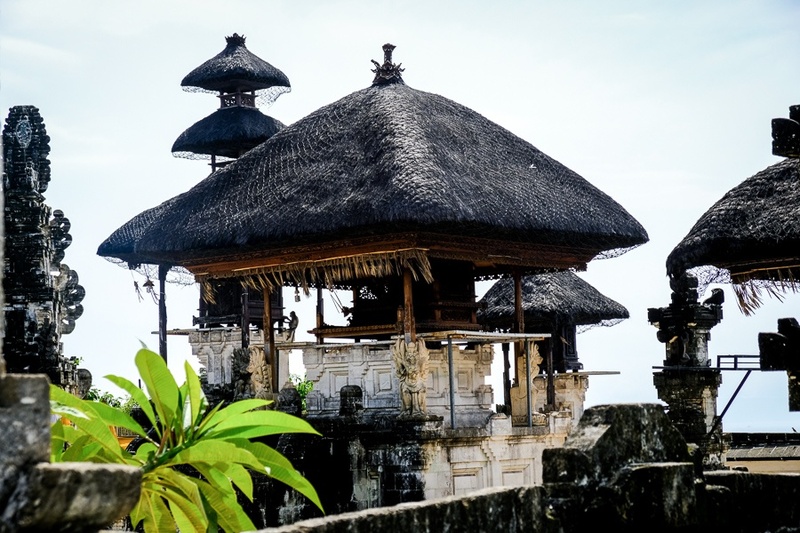 Bali has dozens of old Hindu temples to explore, but the most interesting ones are in Ubud and north Bali. 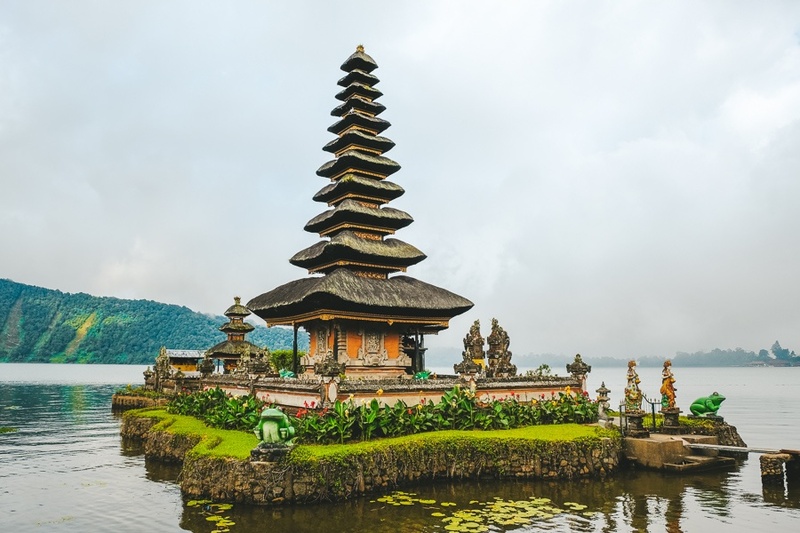 The architecture and history behind some of these is pretty cool, so it’s a good idea to see at least a couple on your trip to Bali. Keep in mind you will need to wear a sarong to enter temples in Bali. This is a traditional skirt you tie around your waist, which can usually be rented on the spot for a small fee like 5,000 Rupiah. 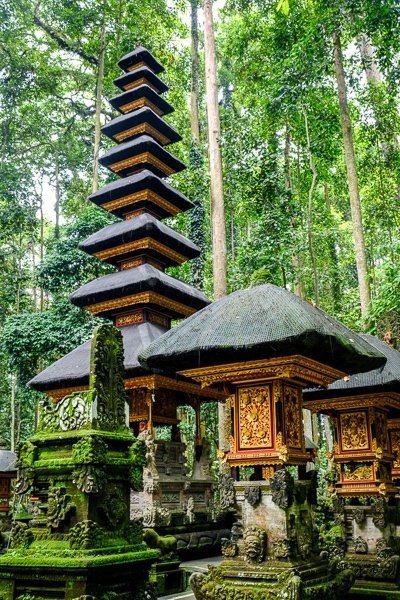 Here are 17 of the best temples to visit in Bali! 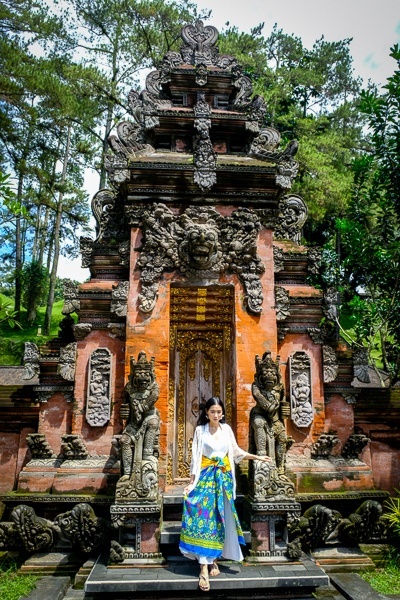 The Saraswati water temple is in Ubud and it has some of the coolest wall patterns and carvings you’ll see in Bali. The doors are insanely detailed and elaborate. Flowers, dragons, demon figures, and more. 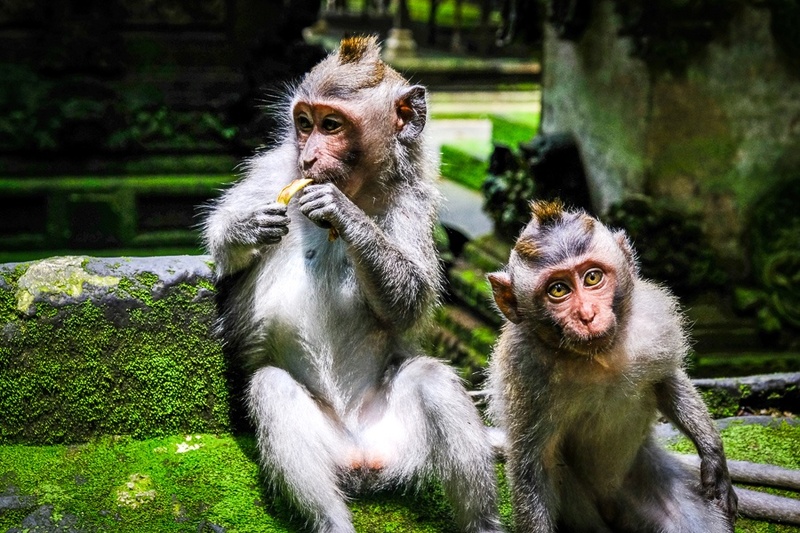 The Instagram famous Ubud Monkey Forest is mostly known for the wild monkeys living there, but it also has some old temples and dragon statues in the jungle that are worth checking out. The whole place has an Indiana Jones-y feel to it. 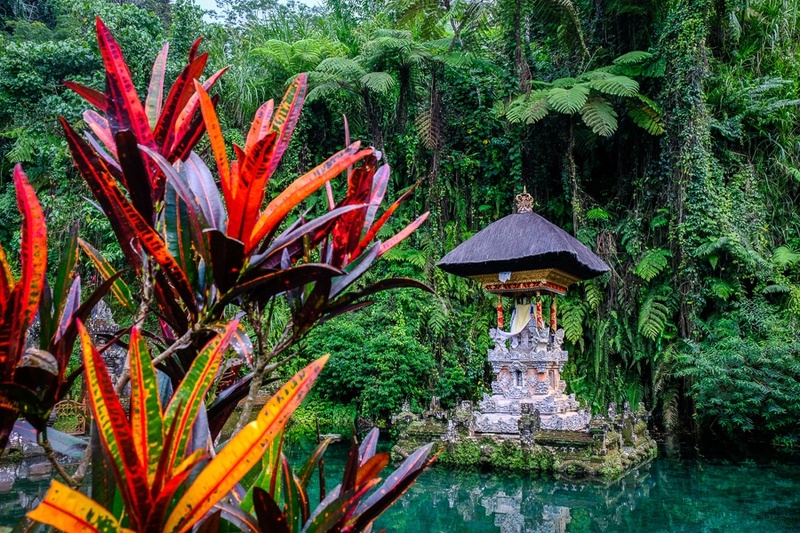 This is an old temple on a crater lake, and it’s arguably one of the most famous and iconic places in Bali. The 12-story pagoda just screams ‘Asia’, and the mountains in the background aren’t too shabby either. 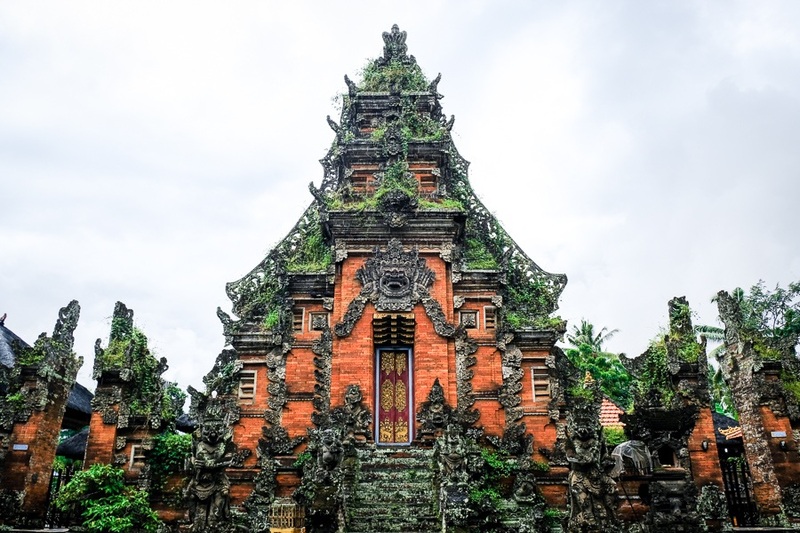 This is one of the oldest temples I’ve visited in Ubud, and also one of the weirdest. The doorway to the cave is really bizarre and unique, and it feels like you’re walking into the belly of some underground rock monster. 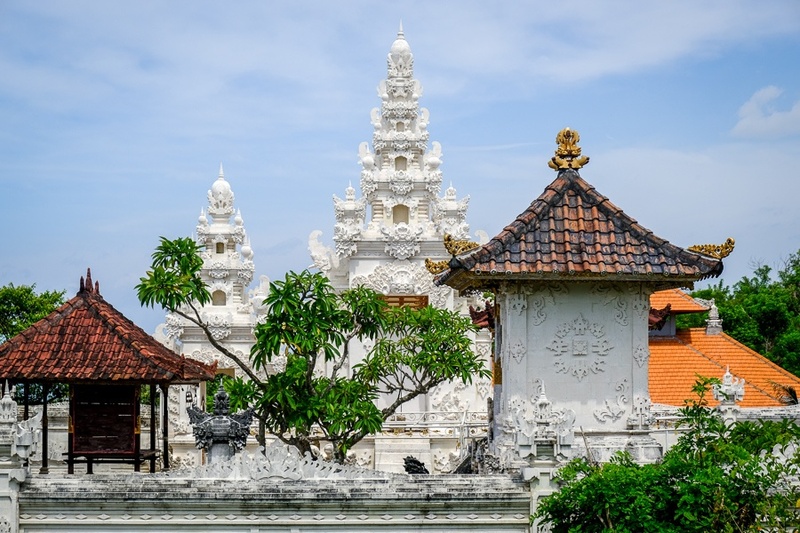 Also known as the Ubud Royal Palace, this one was built in the 1800s and it’s easily the most well known temple in Ubud, partly because it’s located directly in the city center. 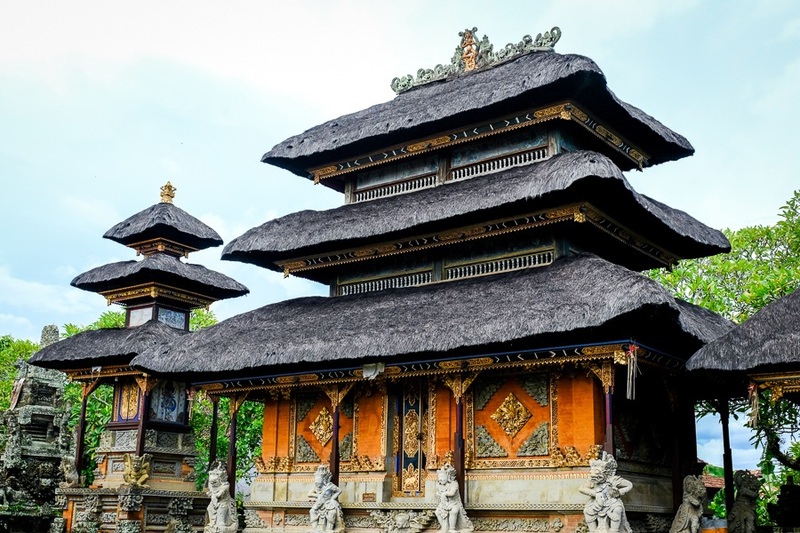 This is one of the easiest temples to visit in Bali. 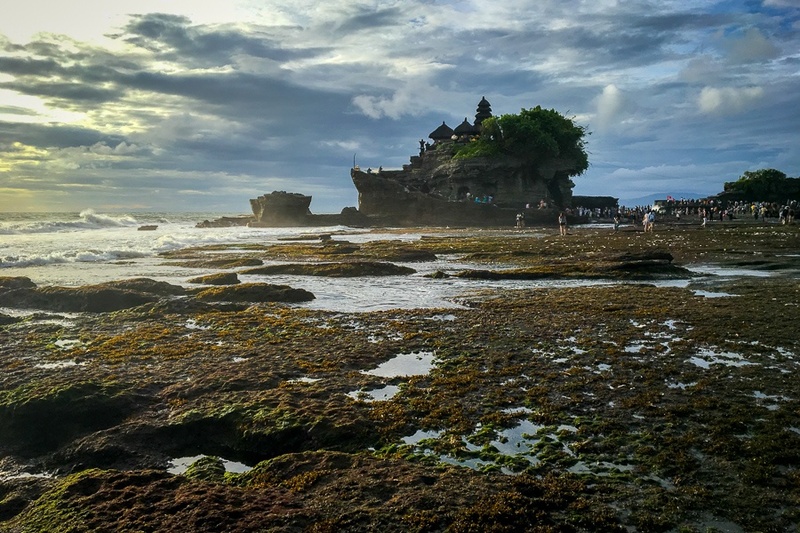 This is a mysterious looking 16th century temple on a rock overlooking the ocean. It’s a popular sunset spot, or you can even walk out closer to it when the tide is low. In my opinion, this is one of the most unique and interesting temples in Bali. 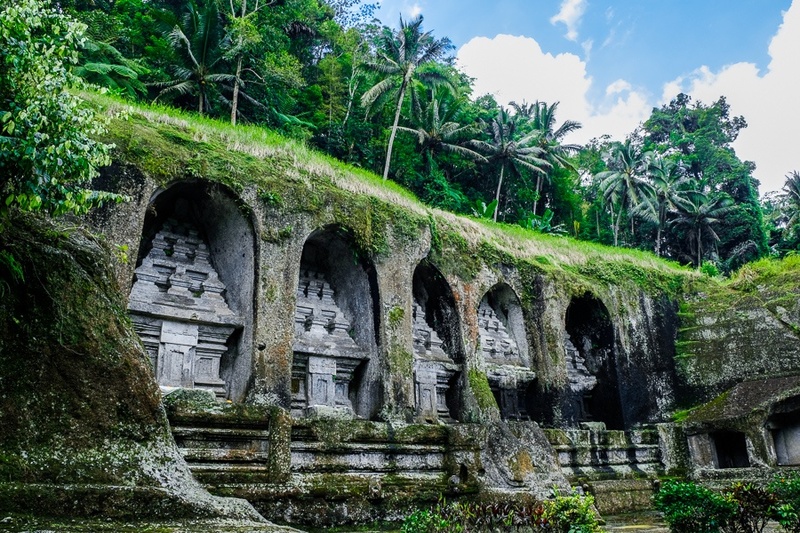 Gunung Kawi is actually an underground temple carved into the side of a cliff. It’s an 11th century temple, and the age of everything here is obvious when you look at it. The name and location of this temple is very similar to Gunung Kawi, but this one is not near as famous. This is a water temple with a beautiful jungle setting. 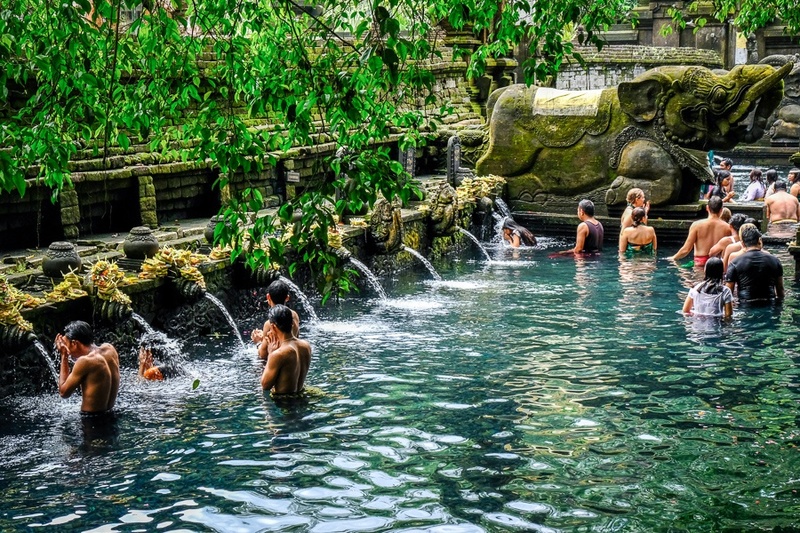 This is one of the most well known temples near Ubud, partly because of the Hindu holy spring where visitors (including tourists) are allowed to bathe and pray, if that’s your thing. In the center of the Sangeh Monkey Forest is a 17th century temple called Pura Bukit Sari, along with several smaller temples scattered throughout the jungle nearby. As an added bonus, you get to hang out with…… more monkeys! I know nothing about this temple except that it looks very old and exotic. There’s foliage growing out of the stone roof top. This temple is easy to visit while en route to the Sangeh Monkey Forest. 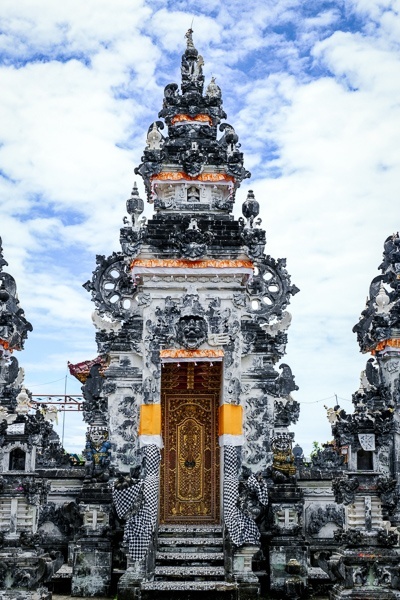 Located in South Bali right next to a beach of the same name, Gunung Payung is a small temple that you can stroll through in just 5 minutes. There’s no entrance fee. Also known as the ‘car temple’, this is a weird one located on the neighboring island of Nusa Penida. 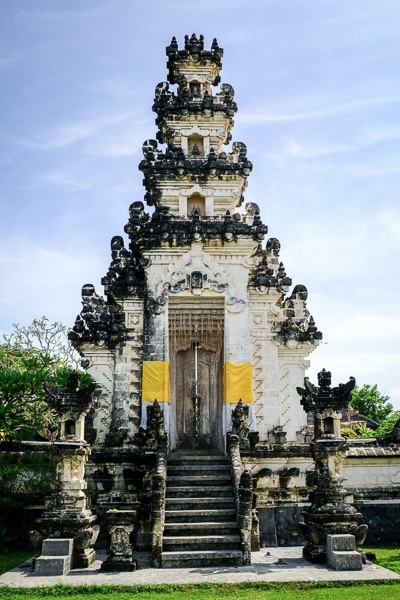 The temple is located near some popular tourist sites like Kelingking Beach, so it’s easy to visit if you happen to be exploring the west coast of Penida. This is another temple located on Penida, but it’s in a cave! After crawling through a tiny hole in the side of the mountain, the inside opens up to a huge cave about 300 meters long, with high rock ceilings. Located on Manta Point in Nusa Penida, this temple is made out of bright white stone, just sitting up there on a cliff in the middle of nowhere. It’s a great area to explore.